This is my first year as a wedding consultant. So when the email arrived in my inbox about the Marry Me Night Market bridal show I seriously considered signing up for a booth. Of course I wanted to do some research first because a booth at a bridal show does cost money. I asked in a couple of Facebook wedding groups if bridal shows were worth it. Hit or miss was the response I received. It really depends on the show and the couples that attend I was told. Well that wasn't helpful. Now when I said how much a small booth costs, Go for it! was the answer from everyone who responded. I signed up for a 5 foot x 5 foot space, the smallest booth I could get. The bridal show was originally scheduled for February but our meteorologists "threatened" snow a week in advice and the show was moved to April. Of course it didn't snow and I knew it wouldn't but to be safe the show was moved. I met with Vintage Meets Modern to rent some furniture and accessories for my booth. Once I figured out what furniture would fit into my 5' x 5' booth I was ready to get creative with how I wanted it to look. I created a secret Pinterest board of ideas to send to the vendors I'd be working with. Letters and Dust was creating the signs for the show and I asked her to make me some as well. I sent her a collage based off my Pinterest board and let her do her creative thing. I also knew I wanted a cake but didn't need a real one. A faux one would do just fine. I sent Sugarhouse Cake the same collage and told her to create one for me. She had free reign to create whatever she wanted. All the other items I wanted for my booth I had on hand. Letting your local wedding community know you're offering wedding consulting services along with your party styling means networking and telling every one you meet how EXCITED you are about the services you're offering. When the Babes Brunch came up, I had to go! Held at The Evergreen in SE Portland, an event space with circular windows to let the light stream in, beautiful brick walls above and white wood paneling below make this space versatile for any wedding theme. Maple flooring adds a touch of warmth. There's a mezzanine above with a staircase leading down to the event space for couples wanting to make a grand entrance, a place to get ready for the wedding or a cozy space for guests to relax from the partying below. The space doesn't feel big, it feels intimate, even though it can host 445 people on the main floor. The theme for this Babes Brunch was day light disco. I can get down with that. I've never been a night owl. And I had the perfect dress for it that I picked up at Target a few years back on sale. I KNEW there would be an occasion for that dress. If you've been a fan of Fizzy Party for awhile, you know I love to dress the party theme. If you hire me as your wedding consultant and want me there on the day of your wedding, I'll totally dress your wedding theme. Go Naked. With your table. Spring weddings are a great time to go naked with your table. Don't hide that beautiful wood table under a full table linen. 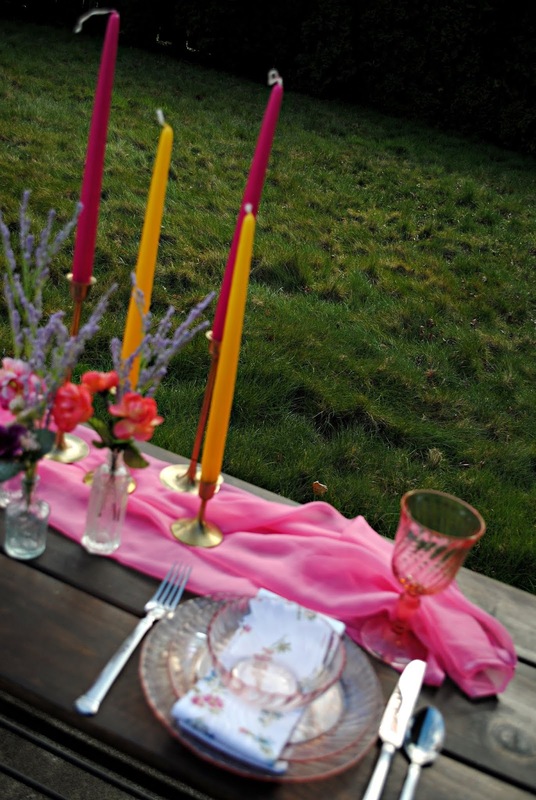 High light the wood with a colourful table linen. I like to go with a lighter fabric for spring weddings. Looking to add some pattern onto your reception table? Do it with the napkins. You can go for something light like this floral pattern or go big and bold. 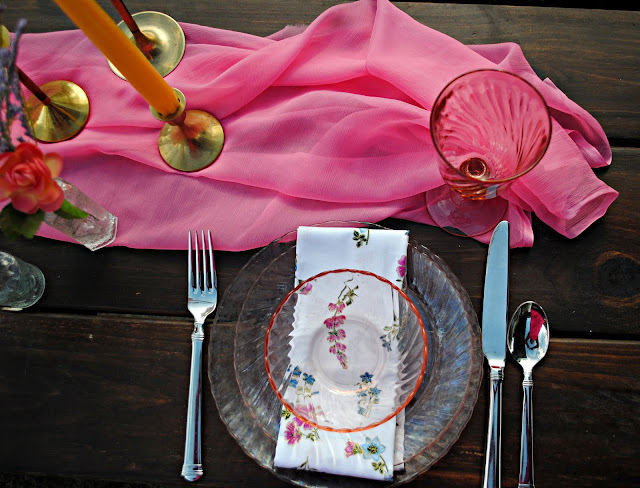 You can even go for a lighter pattern for the table and go with something bolder for the cocktail napkins. Light coloured place settings add a touch of romance to your table. 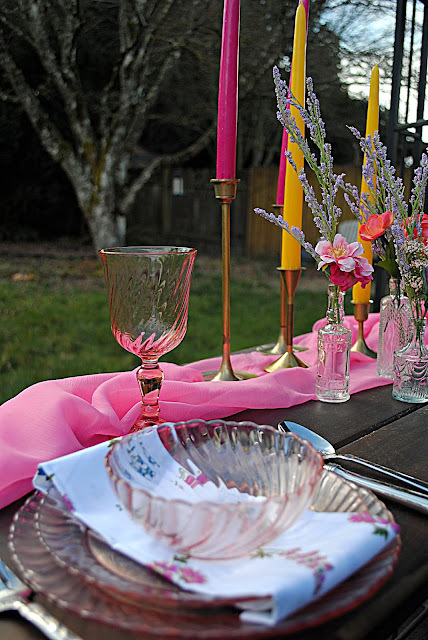 If your larger rental places don't carry coloured place settings, check with the smaller rental companies. 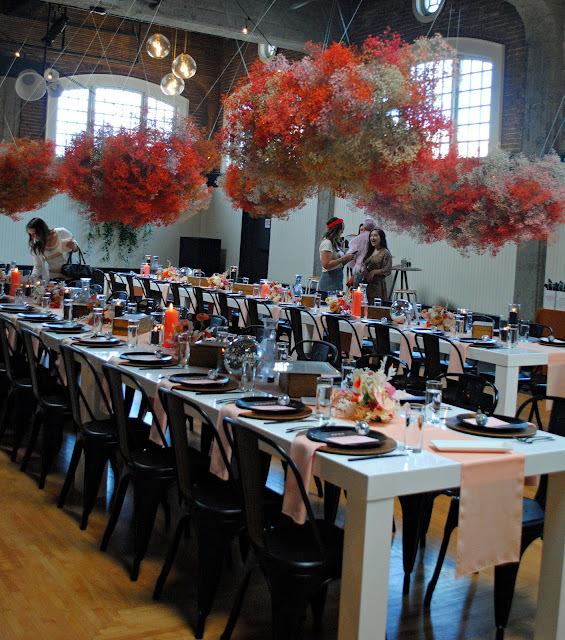 Smaller rental companies tend to have more specialty place settings and other rental items. They might also be more willing to special order items for your wedding if it's something they think they can re-rent out to other couples. Clearly I need to work on my photography skills. This ones a little fuzzy, oops! This is why you hire a professional photographer for your wedding. Yes I know, they seem expensive but SO worth it. Oh sure, you could save some money by having your family and friends take photo's but you could end up with fuzzy pics like mine above. This is your wedding! There's places to cut costs and places not to cut costs. And a photographer is not one of those vendors where you cut costs. 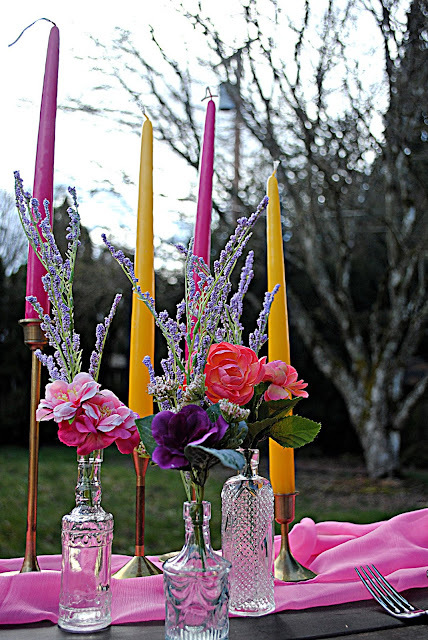 Colourful candles can compliment your floral's. Are you doing as much of your wedding as you can on your own with the help of family and friends ? Pick up or borrow some small glass bottles to hold your flowers. You can get flowers at farmers markets for a great price. 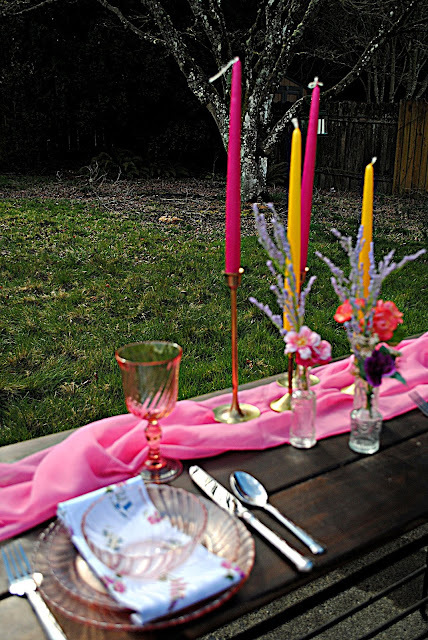 Ask your family if they have any candle sticks you can borrow, rent them or shop your thrift stores for some. Don't worry about them matching. Unless it's just going to bug the heck out of you if they don't match. 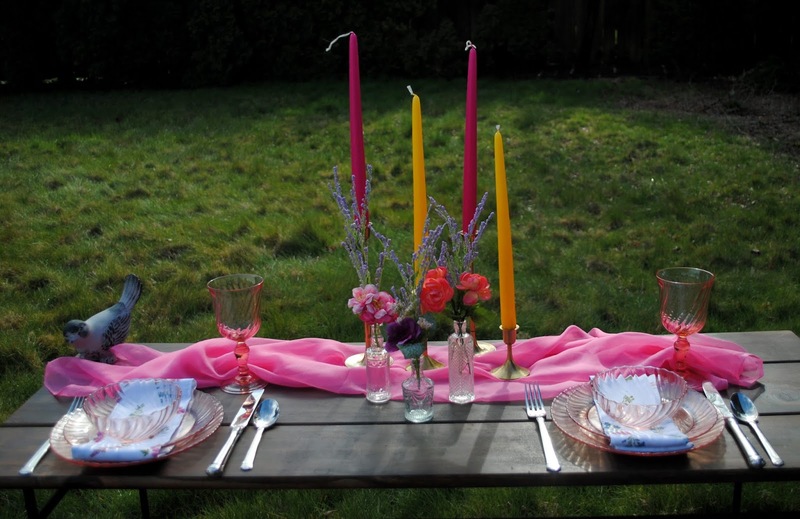 The day I styled this table it happened to be a beautiful spring day. But if you live in Oregon an outdoor spring wedding can be tricky. The day could be beautiful and sunny or rainy. I highly recommend a tent. Don't take a chance on the weather being perfect on your spring wedding day.